Belize NMS: A moderate easterly airflow will support a slight increaese in moisture over some areas later today and tonight. 24-hour forecast: Sunny with some cloudy spells today and cloudy at times tonight. Showers will be generally isolated this morning, then a few showers and isolated tjunderstorms developing mostly over northern and inland areas this afternoon and over the south and coast tonight. General Outlook: Mostly sunny with only isolated showers during Friday morning, then some cloudy spells with a few showers and isolated thunderstorms mostly over southern and coastal areas Friday afternoon and night. Today E 10-20 kts Moderate-Rough 4-7 ft A FEW SHOWERS AND ISOLATED THUNDERSTORMS LATE. Tonight E 15-25 kts Rough 5-7 ft A FEW SHOWERS AND ISOLATED THUNDERSTORMS, DECREASING. Tomorrow E 10-20 kts Moderate 4-6 ft ISOLATED SHOWERS OR THUNDERSTORMS. Outlook E 15-25 kts Rough 5-7 ft A FEW SHOWERS AND THUNDERSTORMS. An upper-level trough extends from the NE corner of the Gulf of Mexico into the Yucatan Peninsula. Broad upper-level anticyclonic wind flow spans the rest of the Caribbean, to the east of the trough. 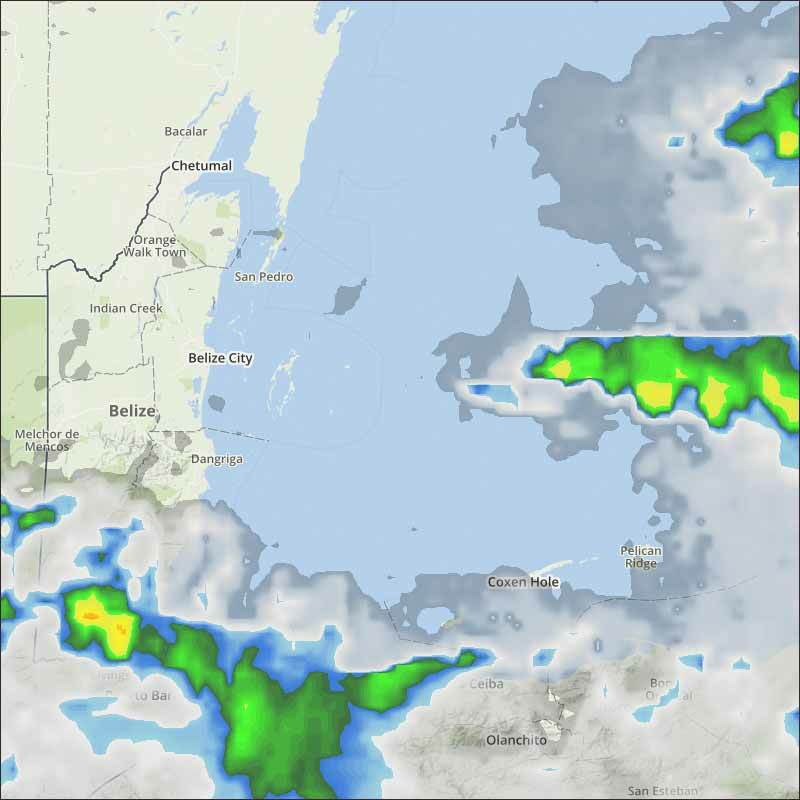 Scattered showers are noted over the western half of the basin mainly west of 73W. 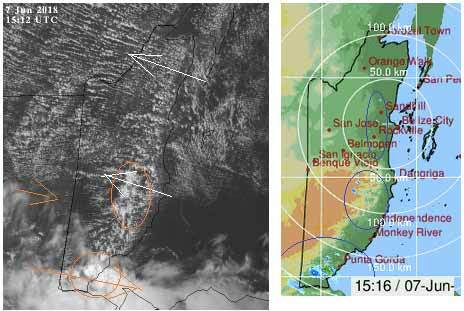 The monsoon trough is along 10N from NW Colombia westward, beyond NW Costa Rica. At this time, scattered showers are along this boundary affecting Panama and Costa Rica. 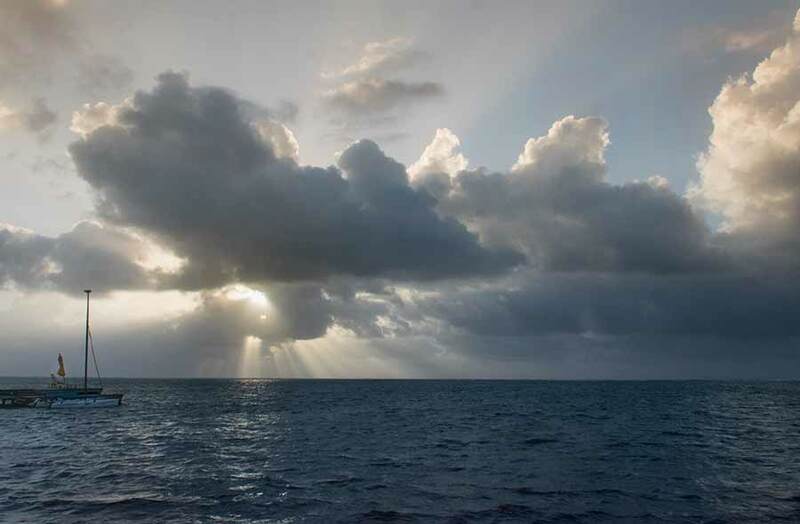 Fresh to strong trade winds will persist in the central Caribbean. The wind speeds will be near-gale force, at night, near Colombia and Venezuela through the weekend. Fresh to strong winds are expected in the Gulf of Honduras through Saturday night. Moderate to fresh trade winds will prevail elsewhere through Sunday. On Ambergris Caye this morning it's windy and the sea around our barrier reef is choppy. We have a East-SE blowing at 15 mph. The expected high temperature for today is 88 f.
The Caribbean easterly winds are back strong this morning. The High-level cloud causing rain is way down south, and is causing some rain around and south of PG. Looks as if today, for most of us, will be sunny, with white clouds developing this morning, not clear yet how this afternoon will develop. The Cloud and rain picture. There is some rain about and it looks as if it is increasing in places. 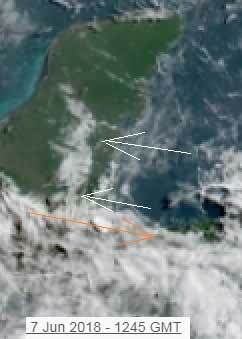 The high level cloud, which is presently only over southern tip of Belize, may well spread further north later.